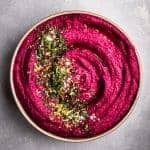 A vibrantly pink, slightly sweet and deliciously healthy beet hummus, very easily made by placing all ingredients in the bowl of a food processor. Combine the chickpeas, tahini, beet, lemon juice, lemon zest, garlic, cumin, and salt in the bowl of a food processor. With the motor running, slowly drizzle in the olive oil and blend until smooth. Taste and adjust seasoning as needed, adding more olive oil, lemon juice, garlic, cumin or salt as needed. I like mine extra garlicky and lemony! Serve in a bowl and sprinkle parsley, za’atar, lemon zest, nuts, big salt flakes or anything else your heart desires. I think swirls of olive oil look dreamy in the dish and taste fantastic. See my pics for different topping options are omit toppings all together. If you have a food processor, now is the time to use it! If you don’t, a blender works too. Use the best possible tahini you can find. Using dried chickpeas will create an even better flavor than canned, but take more time. I *highly* suggest ya try with dried chickpeas sometime. Get playful with toppings options. See some suggestions below and all my pics for ideas. Leftover hummus will keep in the fridge a week. Hummus may thicken up in the fridge, dilute with 1 tablespoon of cold water at a time until you get your perfect consistency again. *Note: to roast a beet, wash and drizzle with olive oil and salt, wrap in tin foil and place in a 400 degree oven, for about an hour (until a fork easily slides in it). Wait for it to cool then peel the skin off, which should peel off easily if its fully cooked through (if it doesn’t that’s a sign that you need to put in in the oven a bit longer).